1. Increase the pressure to 25 bar. 2. Preheat the pipes and turbine. 3. Start the turbine and reach the nominal rotating speed (100% rpm). Table 8.1 shows efficiency data of the elements: solar collector field, storage tanks and power conversion part. The yearly efficiency coefficients have been obtained from the monthly efficiency data. The gross output power of the PCS (Pgross) can be obtained as the difference between the thermal power delivered to the steam generator (Phtf), the thermal power delivered to the refrigeration systems (Prs) and the thermal losses inside the PCS (Lpcs). There are different methods for modeling the power conversion systems. The model presented in this section has been obtained from data taken from the power conver­sion system of the DCS project . The PCS is composed of the steam generator, preheater, steam turbine, and refrigeration tower. The steam generator is fed by ther­mal hot oil coming from the hot oil storage tank. The steam powers the turbine and electrical generator (Stal-Laval) with a nominal power of 577 kW. In other cases, hot oil is directly stored in a tank (thermocline). Thermal stratification of the oil in the tank allows energy to be stored at different temperatures. As an example, in the ACUREX field, the storage tank is connected to the solar field and to the PCS by means of two pipe circuits placed at the top and bottom of the tank (see Fig. 8.1). The heated oil stored in the tank is used to generate the steam needed to drive the steam turbine of the PCS. Different thermal energy storage systems are used in solar plants. In some cases molten salt tanks are used. The basic idea is to use the heat from salt fusion; that is, the amount of heat required to melt a solid salt at its melting point into a liquid without increasing its temperature. The heat capacity of a body is defined as the heat needed to increase the temperature of the body by one degree and since the temperature is not increased during melting, the heat capacity is very high at this stage. The liquid salt releases the same amount of heat when it solidifies. 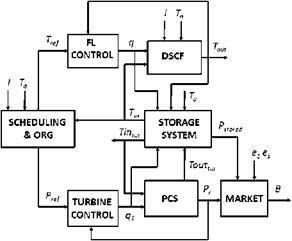 This section analyzes some prediction models needed for scheduling production and optimal control of solar power plants. The most important variable in a solar plant is solar radiation. Different models for solar radiation prediction and forecasting have been explained and developed in Chap. 2, both for short and long term forecasting. Different models of solar collector fields have been developed in Chap. 4 that are useful for optimization purposes (mainly those based on first principles).